The bicycle is everywhere in the streets of Amsterdam, as a part of people`s rhythm of life and of daily culture. Amsterdam is a cyclist`s paradise, but it wasn`t always that way. Around 1960 the bicycle came under huge pressure due to the rapid increase in car traffic. It was only through a unique combination of grassroots activism and municipal policy that the bicycle managed to make such an astounding comeback. Bike City Amsterdam recounts the story of the amazing transformation of a city that made way for the bicycle, while the bicycle in turn helped make the city liveable again. 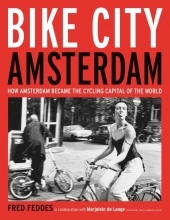 The book highlights the accomplishments of the bicycle city, but also the setbacks and its counterforces. It describes the everyday bicycling culture, as well as the notorious battle for the Rijksmuseum bicycle passageway and the challenges of the near future. The bicycle may well be Amsterdam`s strongest asset in building a healthy, safe and sustainable future. As such, the city offers an inspiring example for other cities struggling to preserve their liveability.